Lorenzo Nuñez found the going much tougher against Mizzou. The HBC. If you’ve read this blog or listened to our podcast, you know our position on head coach Steve Spurrier, and each week the case against his return in 2016 continues to mount. It’s way past time to fire off some “it’s time for Steve Spurrier to go” blog post. There’s pretty much nobody left to convince. Besides, we did that after the Kentucky game. We talked on one podcast a few weeks ago about the five stages of grief as it relates to Spurrier’s time as the head Gamecock. I’m now squarely in the final stage, acceptance, and I suggest you find a way to get there yourself, because it is time to put a new plan in place and move on. This final season is going to be the exact opposite of the way we would’ve drawn up Spurrier’s departure. We would’ve wanted that ever-elusive SEC Championship, followed by a major bowl game, with the HBC holding up a trophy and telling everyone it was a great run but it’s time to step down while on top. Hell, in hindsight, even making that retirement speech while holding the crappy Duck Commander Independence Bowl Championship trophy would’ve been light years better than what we’re staring in the face right now. Instead, what we’re facing is our greatest leader in our most important sport, and one of the most legendary coaches in the game’s history, making his retirement announcement after a probable four-win season, two years removed from a top 10 finish. He’s going to be exactly the guy he didn’t want to be – the coach who hangs around just a season or two too long and leaves behind a declining program in need of a major rebuild. I have a feeling the next eight weeks are going to be the hardest we’ve seen around here is a long time. Nun-YIKES. Lorenzo Nuñez was borderline spectacular in his first start against Central Florida last week. He was basically the entire offense, and he gave Gamecock fans hope that he could salvage our anemic 2015 offense. But in his first SEC start on the road in the other Columbia, he looked like the moment was much too big for him. He made poor decisions, poor throws, and was contained for the most part by a fast, strong and talented Missouri defense. Spurrier said if he’s healthy next week that he’s still the starter, but now I’m beginning to believe the job might not be as hard to win back for Connor Mitch when he returns from injury. That not to say Nuñez doesn’t have a bright future ahead of him, because he certainly does. But if he continues to play like he did yesterday, he just doesn’t have much of a present. 22-Follow. We had a running (pun intended) joke at my high school that we only had one running play, and if was called 22-follow. Those of you who know a little bit about offense know that was a simple dive play where the tailback follows the fullback through the “2” hole. The offense was never that sophisticated, and when nothing else was working we always had the ol’ 22-follow. South Carolina is a major program with one of the great offensive minds in college football history. Though it’s not the 22-follow, somehow it feels like we only have one running play, and it’s not very effective. Yet, we continue to run it despite very little success. I realize we sometimes run a zone read out of it, and we have a stretch play that we run occasionally, but imagine our run game playbook being a half page long and we only use 1/3 of it. Bad Omen. We should’ve known it wasn’t our day yesterday after the first three possessions. 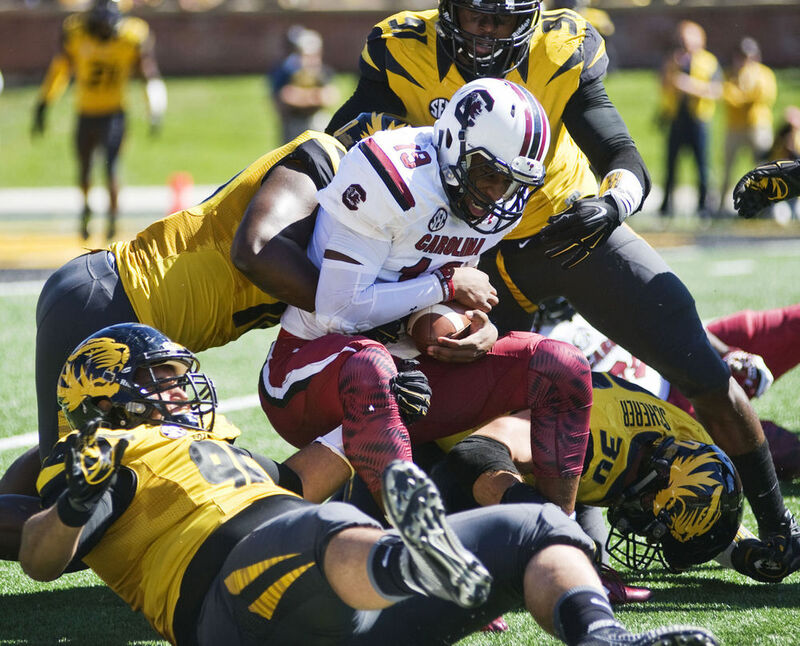 The game started with USC forcing a three-and-out, followed by a shanked 24-yard punt by Missouri. We took over at the Tigers’ 49-yard line, proceeded to lose 17 yards, and then Sean Kelly returned the special teams favor with a 17-yard punt. The net? Missouri took over at the same place our drive started without the benefit of a turnover. That’s hard to do. Oh, yeah, they went on to score a touchdown too. Miracle in CoMo. ESPN showed highlights of the last time we traveled to Columbia, Missouri. It’s a great memory, probably one of the top 5 Gamecock games of all time, and will get greater with time. Unfortunately it was only two years ago, and it feels like ten. Washout. Tbone, Gman and I headed to the coast on Thursday for out semi-annual fishing trip. We knew the weather forecast wasn’t conducive to fishing, but the older we get the less the trips are about actual fishing and the more they are about just getting away for a few days. On Saturday morning, with the waters rising around the house where we stay, we decided to trek up to Gman’s house where it would be “safe”. We had a nice day of watching football on Saturday, but woke up Sunday morning to “considerably more” rain than they had originally called for in Columbia. It took a while for us to find literally the one road out of town (me to Atlanta, Tbone to Greenville), but fortunately we made it out just in time. The Gman’s yard got quite wet, but his house is fine, which is more than can be said for many of his neighbors. All of you have probably seen the devastation, with many people temporarily displaced and others who have basically lost their homes. If you’re in the Columbia area and have the ability and/or resources, we encourage you to lend a helping hand to those in need. If you’re not in the area, look for other ways you can help, most likely through financial donations. If you know of any opportunities to donate food, clothes, money, or even give someone temporary shelter, please tweet them to us and we’ll gladly RT. We may not all be Gamecocks, but we all take great pride in our state and our people. Please help out where you can. Does the fact that Clemson is not only undefeated but they are getting nothing but love with their “defining” and “signature” win over Notre Dame hurt us more? I feel like the 80’s when we were always looking up at Clemson who was on TV (before all games were) and was consistently beating us on the field and in recruiting. Feels that way again. Clemson is talking an undefeated season (and it is lining up perfectly for them) while we Gamecocks are looking at 4-8. That hurts. It hurts that Dabo is being mentioned as this great coach, this great architect of this incredible program while South Carolina is listed at just above Vanderbilt in the SEC. I know that Clemson play a weak schedule compared to the SEC but it still hurts. Good point TSD, no doubt about it. Clemson being wildly successful while we’re going in the tank definitely makes all this feel much worse.